PhoneEX - makes your WM5-6 phone act like an iPhone | Tech for Lunch! My mobile phone is an HTC P4000 on the Telus Network. It runs Windows Mobile 6 and does a pretty good job on most everything I need it for. However, as in many Microsoft products, there are quite a few areas that can be improved and rendered more enjoyable to use. Not too long ago, I came across a very cool extension for my phone called PhonEx. This excellent extension by Iconsoft completely changes the way your contacts and phone functionalities work and makes it all a lot more interesting. PhonEx is one of those plugins that once you get used to having it around, you just can’t live without it. I’ve tried many plugins and applications that modify my contacts and/or my phone, but I always ended up removing them because they either caused problems or simply didn’t have the features I was used to with the standard WM6 functions. PhonEx is not subtle in its changes and that’s what makes it work for me. I love the scrolling contacts and the large dial-pad the most. The Today plugin is also a very nice feature and let’s you change settings and access your contacts and favorites in no time. The contacts manager is probably the most interesting feature there is because it is the one that sold me to this extension. You can scroll through your contacts using just your thumb, just like on the iPhone. no need for the stylus or the scroll bar. Not only is this convenient, but it make your phone look and feel less antiquated. Everything moves around smoothly, even on my older processor. When you select a contact, the screen slides to the left and brings up the details of that contact, with a larger image and options to contact that person in a variety of ways: Call, Email, SMS etc… whatever you have entered is available. This is where you can modify your contact’s information, assign a new picture etc… I didn’t have pictures for everyone before, but since I installed PhonEx, I’ve been taking more pictures and trying to get more of my contacts updated because it simply looks good and makes that contacts list more attractive. From there, you can access your favorites, which is a list of people you choose to be easier to reach instead of having to go through your entire contacts list. 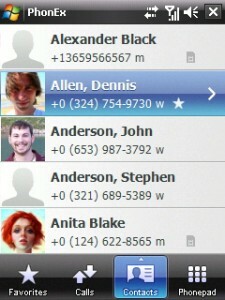 You can see a list of all your calls including incoming/outgoing and missed calls. Finally, you can also go directly to the phone pad for manual dialing. You could use the “send” key which gets reassigned to PhonEx and takes you to the phonepad as well. The large buttons on the phonepad allow you to use your thumb only and, in my case, responds much much faster than the standard WM6 one. For instance, when accessing my voicemail, there was a huge lag when entering my passcode. With PhonEx, I can tap the numbers as fast as I want and everything works just fine. 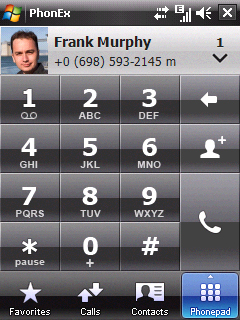 There are a number of other great features like the full screen incoming calls. When you receive a call, you get that on the entire screen, showing a picture of the contact (if you put one in) along with the number and location if it’s available. Once you’re in a call, you have access to all the usual features, but with large buttons and it even lets you see if you are on Bluetooth right away. You can conference someone else in and put them on Hold, Speakerphone or Mute. You have access to the phone pad as well which is useful for dialing extensions or passcodes as I mentioned earlier. PhonEx is certainly an excellent extension to have on your Windows Mobile Smartphone. You can give it a try for free for 15 days and see for yourself.